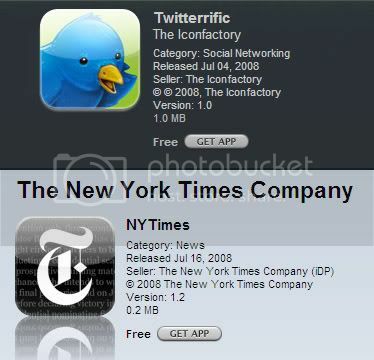 I believe that most of the content-based iPhone applications are going to be free over time... and early indications are that this is the case with top free apps include the New York Times, Wordpress, Twitterific, Sports Tap, Jott, etc subscribing huge numbers of new users and downloads. 1) justifying the apps and 'free' distribution as an effective lever for user acquisition. Jott and other brands are experiencing huge recognition and user-growth. 2) monetizing the app with-in-application advertising. SportsTap has a persisent Google Mobile ad atop each 'page'. Notably, I've missed clicked the remarkably-small "home" icon and accidentally made SportsTap a fair amount of AdSense revenue. Twitterific introduces ads inline among the message stream. The ad unit seems to be built and sold in-house. It's good looking and says "Ads via the Deck". New York Times also seems to be selling in-house ads that are colorful and persistent on the bottom of each article page. No ads appear on the home screen or category screens. So who wins here? It's a major platform for AdMob to extend their mobile advertising reach and for Google Mobile to make a serious splash. Google has struggled to win mobile thus far but could hypothetically increase publisher payouts to win real estate being opened via the iPhone (akin to how Yahoo tried to win real estate during the Yahoo Publisher launch). The ad formats aren't (yet) standard, so I also suspect we will see a significant amount of ads sold in-house by the major players... similarly, I don't suspect there will be huge ad variety in the short term (inventory and quantity of advertisers does not yet match the available real estate). But what will Apple do? Clearly the platform growth is important and beneficial... but as Google, AdMob and Developers monetize their applications, you can bet that Apple will try to figure out how to get in that stream.